We solve countless problems--big and small--every day. With so much practice, why do we often have trouble making simple decisions--much less arriving at optimal solutions to important questions? Are we doomed to this muddle--or is there a practical way to learn to think more effectively and creatively? In this enlightening, entertaining, and inspiring book, Edward Burger shows how we can become far better at solving real-world problems by learning creative puzzle-solving skills using simple, effective thinking techniques. Making Up Your Own Mind teaches these techniques--including how to ask good questions, fail and try again, and change your mind--and then helps you practice them with fun verbal and visual puzzles. The goal is not to quickly solve each challenge but to come up with as many different ways of thinking about it as possible. As you see the puzzles in ever-greater depth, your mind will change, helping you become a more imaginative and creative thinker in daily life. And learning how to be a better thinker pays off in incalculable ways for anyone--including students, businesspeople, professionals, athletes, artists, leaders, and lifelong learners. 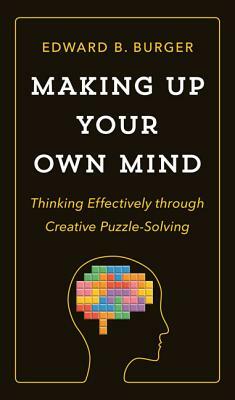 A book about changing your mind and creating an even better version of yourself through mental play, Making Up Your Own Mind will delight and reward anyone who wants to learn how to find better solutions to life's innumerable puzzles.